Department of Zoology, Malacology laboratory, DDU Gorakhpur University, Gorakhpur 273009, Uttar Pradesh, India. Introduction: Paper demonstrates effect of the active molluscicidal components arjunolic acid (Terminalia arjuna bark) and procynadine (Tamarindus indica seed) on the activity of acetylcholinesterase (AChE) and phosphatases (ACP/ALP) in the cerebral ganglion of snail Lymnaea acuminata. Materials and Methods: Kinetics of AChE/ACP/ ALP inhibition in the cerebral ganglion of snail Lymnaea acuminata was studied via in vivo (40% and 80% of 96 h LC50) and in vitro treatments (0.3 μg to 7.0 μg) of the column purified fractions, arjunolic acid and procynadine. Results: In vivo exposure of procynadine and arjunolic acid significantly inhibit acetylcholinesterase (AChE), acid phosphatase (ACP) and alkaline phosphatase (ALP) activities in the cerebral ganglion of L. acuminata exposed to 80% of 96h LC50. In in vitro treatment maximum inhibition in AChE/ACP/ALP activities in the cerebral ganglion of snail were noted when exposed to 7.0 μg of arjunolic acid and 0.9 μg of procynadine. Column purified fraction of T. arjuna bark and T. indica seed caused non-competitive and uncompetitive inhibition of AChE activity, respectively. Column purified fraction and arjunolic acid of T. arjuna bark caused uncompetitive inhibition of ACP while column purified fraction and procynadine of T. indica seed caused competitive inhibition. 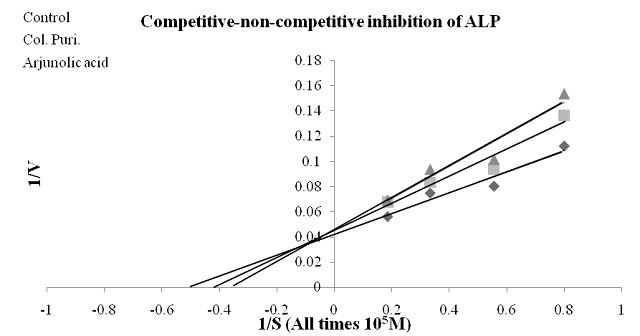 Competitivenon- competitive inhibition of ALP activity in the cerebral ganglion of L. acuminata was observed after treatment of column purified active components of both plants. Conclusions: The molluscicidal activity of T. arjuna bark (arjunolic acid) and T. indica seed (procynadine) against snail L. acuminata is due to the inhibition of AChE/ACP/ ALP. Their inhibition kinetics against AChE/ACP/ALP, were different in cerebral ganglion of snail. Soni N, Singh DK, Singh VK. Inhibition Kinetics of Acetylcholinesterase and Phosphatases by the Active Constituents of Terminalia arjuna and Tamarindus indica in the Cerebral Ganglion of Lymnaea acuminata. Pharmacognosy Journal. 2017;9(2):148-156.